I hope everyone enjoyed their time off and had a wonderfully filling Thanksgiving! I enjoyed getting to see friends and family and sleeping in. However, I've also been working on how to improve my students "craft" during our nonfiction writing unit. 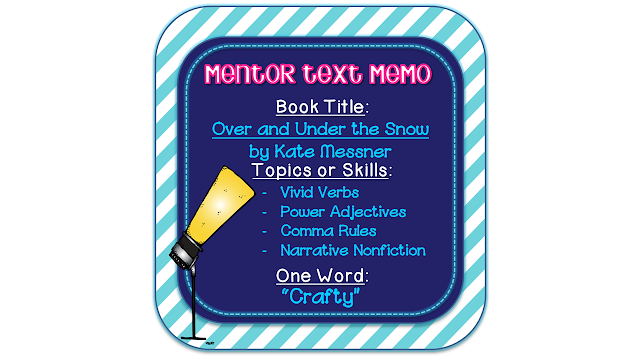 I really wanted to offer some mentor texts that showcased great nonfiction writing. We've read a lot of articles from National Geographic for Kids and Super Science magazines- but I wanted something else. So, after reading blogs and searching through Amazon. I found two author's craft gems! My first book I found through through one of my favorite blogs, Joy in the Journey. Jessica shared the book, All the Water in the World by George Ella Lyon on her blog. Plus, she has a great vocabulary word wall to accompany the book. Check out her post here. The book is amazing! So after reading her blog and checking it out on Amazon, I had to have it for my nonfiction unit. While purchasing All the Water in the World by George Ella Lyon, Amazon so kindly recommended some other books for me. So, course I had to take a peek and see what else was out there for my nonfiction unit. That's where I found another great book with powerful writing and vocabulary. The book is called Over and Under the Snow by Kate Messner. This book is not entirely "nonfiction" - more narrative nonfiction which we will be studying in January. However, I love how the author weaves facts and details about animals in the winter through a plot about a family skiing through the woods. This was definitely the type of author's craft book I was looking for. I can't wait to use it after we finish drafting this week! The author blends facts with powerful verbs/adjectives and many different uses of commas that we've been studying in our mentor sentences. Plus, there are stunning illustrations! "Trees rattling leftover leaves" - such great craft! I love nontraditional use of verbs like "clouds whisper down feathery-soft flakes"
This book could be a great tie in at younger ages to animals during winter. It also has facts about all the animals mention in the book in the Author's Note at the end of the picture book. I'm glad I found this great text to share with my students and add to my collection! Don't forget to link up with Collaboration Cuties with your favorite must read Language Arts Mentor Texts! 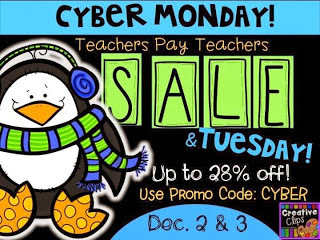 Also, I'm having a TPT sale for Cyber Monday & Tuesday! My store doesn't have much, but check out all the great work on Teachers Pay Teachers! Don't forget to use the promo code CYBER during checkout! The adorable button is courtesy of Creative Clips. This is a great book suggestion. I love the language, and the illustrations too! I will definitely pick this one up for my class. Bagi anda yang lebih memilih tips pencegahan penykait ambeien dengan konsumsi herbal, ace maxs bisa menjadi pilihan anda. Sofia e obat pelangsing badan moiat roden grad, http://obatparubasah.com na moite roditeli i na moite deca! Interesuva me dali toi e rodniat grad na horata,koito se kandidatirat za Obat kanker paru-paru kmetove i dali te mileiat za nego kato za takav! Sofia e mrasna, a gradskia http://obatnyerisendilutut.com transport pretapkan, http://gastrichealthtablet.org zashtoto mnogoobat jantung rematik ot horata ne se http://pelangsingkapsul.com chuvstvat kato v svoia roden grad, a obat sinusitis anak kato che li tuk sa za malko i vremenno! http://mlmgreenworld.com kato che li tuk sa za malko i vremenno! tetap berikan informasi yang bermanfaat gan. kami tunggu informasi menarik lainnya. The length of human’s life is measured by good things that he has done, and time becomes its diamond for wise people. Best friends will act silly things to make you laugh when you are sad. I read this information , and I think this is interesting information . Jual Obat Herbal Tasik terbesar dan paling terpercaya. Kami agen dari obat herbal terpercaya siap melayani pemesanan anda dengan baik. Bagi anda yang sedang mencari Pengobatan Ginjal Kotor Tanpa Cuci Darah anda telah memasuki website yang tepat karena kami akan memberikan solusi yang paling tepat. Sebelumnya kita bahas terlebih dahulu mengenai penyakit ginjal kotor yang mungkin jarang didengar oleh telinga kita namun sebenrnya dapat terjadi. Do not give up on your dreams. Dreams give life purpose. Remember that the key to success is not happiness, spirit!